We offer over 25 years of professional tournament planning services with all of the necessary event amenities for a top-notch tournament and post tournament banquet. 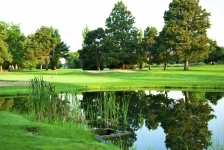 We are proud to be the course of choice for over fifty tournaments annually. 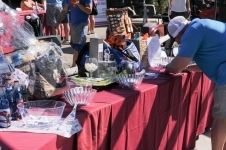 These events are hosted by some of the valley’s foremost corporations, professional organizations and charities who return to Eagle Hills year after year. 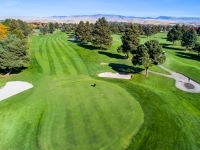 You and your guests will enjoy eighteen championship holes enhanced with rolling hills, sparkling lakes and mature trees, set amidst the beautiful Boise mountains. 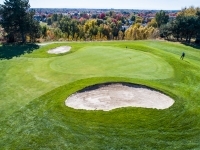 See why GOLF Magazine named Eagle Hills “One of fifty best bangs for the buck in a public course”. 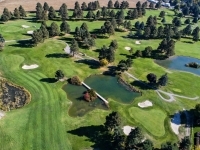 Experienced golf professionals make the planning process easy. Tournament hosts need only to provide the players and we will take care of the rest. 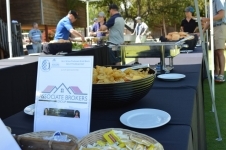 With our acclaimed team of on-site chefs, new tournament pavilion, indoor banquet room and full bar capabilities, we also offer the best in golf tournament food and beverage. 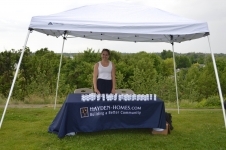 Additionally, we offer complimentary marketing services, at your request, to help increase player turnout. We include complimentary score sheets, score posting and scoring with custom scorecards printed with player names and the company logo. For no additional charge we will create and print 11x17 sponsor signs, closest to the pin and long drive markers and cart placards with hole assignments. We include menu planning and preparation by our acclaimed chef team. Post tournament functions include tables and chairs with set up and take down. We offer a full bar with friendly and experienced bartenders, as well as on-course beverage carts. Beverages may be host or no host. Our full stocked pro shop offers a variety of apparel, balls and accessories. Discounts are provided on merchandise for tournament prizes. 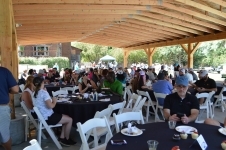 For no additional charge we will include your event on our website, social media and e-newsletter, as well as post flyers at the golf course clubhouse. Hole 11 par three over water. 2017 Jayden Deluca Foundation Tournament. 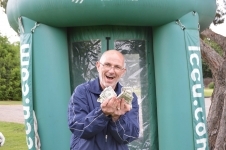 Stan Thomas Gives Back Tournament sponsor check in. 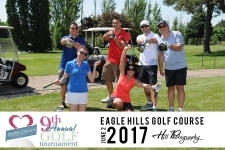 Competitive rates make Eagle Hills affordable for most organizations and allow charitable events to maximize funds raised during their tournaments. 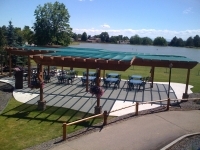 *Volume discounts available for large events, as well as early or late season dates. Call or email us for a price quote: Dave Radcliffe, General Manager, 208.939.0402 or Email Dave. Range included with golf tournament pricing. Carts set up during the Stan Thomas Gives Back golf tournament. Our full service catering department offers the following popular barbecue choices below, but our full catering menu is also available. You may schedule a consultation to build a custom menu tailored to your event theme and budget. Our acclaimed chef team caters dozens of high end weddings and other special evens throughout the year in addition to our golf tournament barbecues. Please also budget for Idaho sales tax and a 20% service charge added to all food and beverage selections. Post tournament BBQ in our Rose Garden Pavilion. 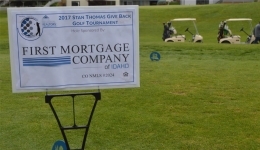 Idaho Central Credit Union hole sponsor. A $400 deposit is required to secure the date of your golf tournament. 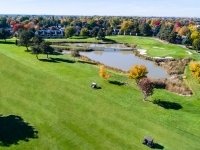 Full payment is required the day of the event and it the tournament chairperson’s responsibility to collect player fees and submit one single payment to Eagle Hills Golf Course. A confirmation of players, grouped into teams of four, and menu selection is required one week prior to the tournament. Once confirmed, this count may not be reduced. All players must ride in power carts. 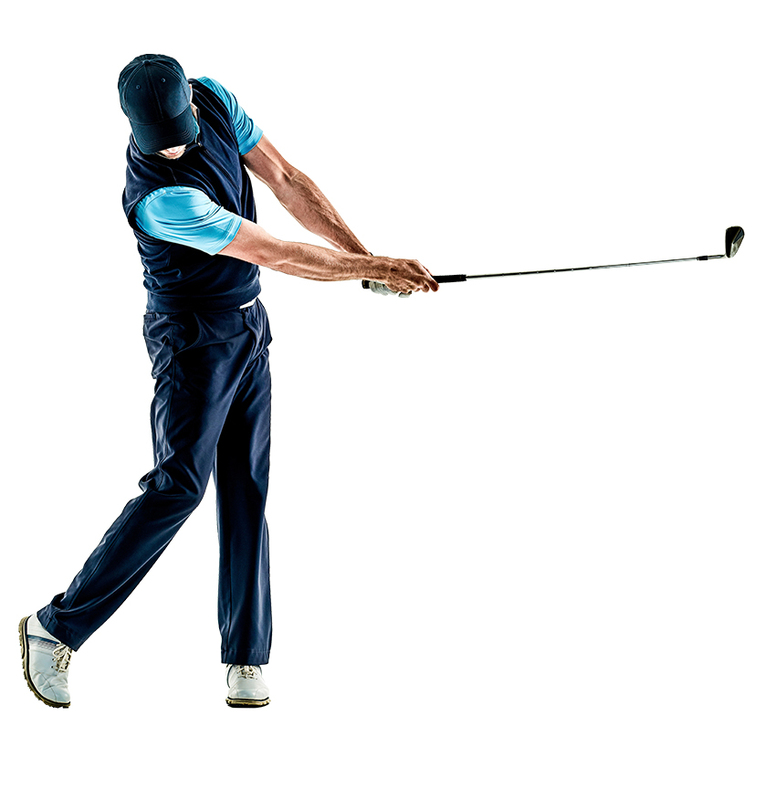 Players must acknowledge standard golf rules and etiquette, and accept responsibility for course or cart damage.